04/19/2019 | Where Does Carter Page Go to Get His Apology? The desperation seems to have set in big time for the Democrats. 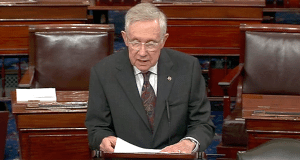 With their afflicted candidate now a question mark for surviving until the election, they sent “Old Mush Mouth,” Harry Reid out to replay old, ineffective arguments that are meaningless and pale in comparison to the actual criminality of Hillary Clinton. Reid’s also their go to guy when something particularly nasty needs to be done, like and unsubstantiated character assassination. First Reid brought up a new hit piece that was written for Newsweek by Kurt Eichenwald in which he points out what we already knew, that Trump’s company is international in scope and insinuates that because of its success we would have to be concerned that he wasn’t doing what Hillary Clinton has already been doing through her Clinton Foundation. Of course Eichenwald doesn’t say it that way, they completely ignore the criminality of the Clintons and instead attempt to assign some where it doesn’t exist, with Donald Trump. It’s a disingenuous and obvious attempt to hurt Trump’s candidacy, rolled out as Hillary Clinton literally nosedived. Wormy Harry Reid had it entered into the record so that future generations would know just how sleazy the Nevada Senator was. He goes on to remind us of the non-issue of Trump University, reading a negative letter from a supposed manager and saying afterwards, “But Trump University is only one. Trump has been ripping-off people for a long, long time.” Harry Reid, who has been getting rich selling favors to the Chinese and use of BLM land just called Donald Trump a thief. He’d better have more than the letter of one former manager to back that claim up. That’s lawsuit material and Trump isn’t shy about using the courts. Reid isn’t walking into this blind, although one eye still is a little lazy, he says, “And when Trump gets sued for not paying here’s what he does. He hires lawyers, lots of lawyers most of the time, to defend him for having cheated lots of people.” Harry is a lawyer, he might want to get started preparing his own defamation defense. Of course if he had swindled people he’d be in prison but Reid ignores the fact that we have laws against such things. He asks, “Why would he change as president. The answer’s simple. Trump won’t change. He’s asking us to let him get rich scamming America. He finishes reading and stumbling through the rest of the text, saying, “Trump is a human leech who will bleed the country and sit at his golf resort laughing at the money he has made, even though working people, many have been hurt or ruined. Forget that Trump knows how to create wealth and success rather than the Democrat ideal of misery. Ignore the fact that he employees many middle class people across America and knows them well. Forget that Harry Reid has gotten filthy rich on a Senator’s salary and everything that they accuse Trump of possibly doing in office has already been done by Hillary Clinton, Hussein Obama and the rest of the globalist pirates. Yep, desperate times have arrived for Dingy Harry and his criminal gang. 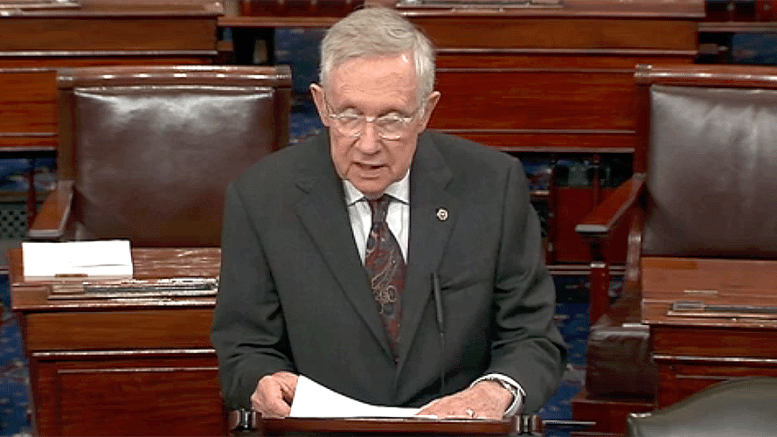 The words vile and despicable POS don’t begin to describe Harry Reid.